A Chinese advocacy organization has filed a friend of the court brief with a federal appeals court before a hearing next week to reverse an injunction a federal judge in Texas placed on President Barack Obama's immigration executive action. Chinese for Affirmative Action (CAA), based in San Francisco, joins civil rights and immigrant rights organizations nationwide in the amicus curiae brief to implement immigration relief programs without delay, including extended Deferred Action for Childhood Arrivals (DACA) and Deferred Action for Parental Accountability (DAPA), said CAA in a press release on Monday. The injunction was imposed by US District Judge Andrew Hanen in February to block the president's executive action, which is expected to protect roughly 5 million undocumented immigrants in the United States from deportation. Twenty-six states, led by Texas, convinced the judge that they would suffer financial burdens if the relief programs were implemented, as the immigrants would be issued work permits and driver's licenses and be able to apply for federal benefits after meeting certain requirements, like passing a criminal background check. They also argued that the president failed to follow required procedures for changing federal rules. "The president is abdicating his responsibility to faithfully enforce laws that were duly enacted by Congress and attempting to rewrite immigration laws, which he has no authority to do," Greg Abbott, at the time Texas attorney general, said in a statement in December. Abbott, a Republican, is now the governor of Texas. The US Department of Justice has appealed the judge's ruling to the 5th Circuit Court of Appeals. A hearing is set for April 17. Immigrant rights groups are optimistic the injunction will be lifted for DACA and DAPA to be implemented later this year. Some organizations already have begun planning to respond to the anticipated need to provide immigration services, according to the CAA release. Both scholars and advocates have highlighted the widespread economic and social benefits of these programs, including providing labor protections, raising wages, increasing tax revenue and creating new jobs, said Annette Wong, immigrant rights program manager with CAA. According to the Center for American Progress, a public policy research and advocacy organization, the president's executive action will raise an additional $3 billion in payroll taxes in the first year, and $22.6 billion over five years, as workers and employers get on the books and begin paying taxes for the first time. The White House Council of Economic Advisors also projected that DACA and DAPA implementation will decrease federal deficits by at least $25 billion over the next 10 years with higher labor force participation and increased wages. In California, immigrant rights leaders are asking state legislators to take leadership on immigrant integration by advancing a state budget proposal - One California - to provide education, outreach, and assistance for citizenship, DACA and DAPA, said Wong. The proposal would invest $20 million to support the capacity and reach of qualified non-profits and legal service organizations to assist immigrant communities in applying for citizenship or deportation relief. The immigrant rights groups argued that the state's investment in immigrant integration has the power to lift families out of poverty and increase their financial security. The Fiscal Policy Institute predicted that immigrants who receive work authorization under the executive actions would experience a 5 percent to 10 percent increase in wages, on average. 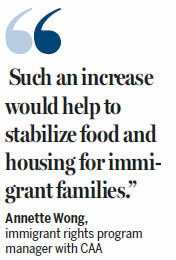 "Such an increase would help to stabilize food and housing for immigrant families," said Wong. "While the injunction remains, we encourage immigrant communities to stay informed of immigration updates from credible community and government agencies and to be wary of and report any fraudulent services seeking to exploit prospective applicants," Wong said. Last edited by imblest; 04-13-2015 at 01:20 PM. To reverse that injunction would require a false interpretation of law. May Heaven forbid courts to legislate, too. The Chinese are buying the United States for pennies on the dollar with those, is it HB -5 visas?, they're running birth tourism trips to get themselves free citizenship, and if anybody checks DMV in San Francisco, it will certainly look as if the Chinese have been over staying their visas big time. We can't really blame them. Most Democrats and much of the Republican leadership are pursuing an Open Doors policy. The Chinese, like the Mexicans and the Central Americans, are just taking advantage of what they perceive as people who are either stupid or weaklings. Last edited by imblest; 04-13-2015 at 01:21 PM. Contact the group Chinese for Affirmative Action (CAA) and let them know you do not appreciate their support for both amnesty for illegal aliens and Obama's use of unlawful and unconstitutional means to implement Amnesty. Let them know that such harmful and destructive actions should not be taken by groups like CAA that are more aligned with the communist foreign government of China than with American citizens! Last edited by imblest; 04-13-2015 at 01:22 PM. We need more volunteers helping create these activism alerts out of article and more people engaging in the requested activism. Please post comments here to us with feedback and things you learn when you call! We get rid of criminals we don't want here. China gets back their criminals they want to prosecute. Last edited by JohnDoe2; 04-13-2015 at 12:40 PM. Bankrupting the USA through 501 C 3 tax fraud "charities". If governments can't do it fast enough with programs that benefit all Americans, then they do it with programs that benefit no Americans.